Sure, barcodes may seem a little retro these days, but they're still ubiquitous. One of the places you may wish to create barcodes is on the web. There are various ways to approach this - special barcode fonts, spans for each line, server generated images, etc. Although many solutions are available, I thought I'd add mine into the mix. First note the comments, these are just there to ensure there is no white space between the elements without having to write everything on one line. So let's forget about these and concentrate on the rest of the HTML. At the outer level whe have a span with class name barcode, this element wraps up the entire barcode. As we will see below we have styled the barcode with relative sizes so that changing the font-size on this outer level element changes the entire barcode size to match. The first child of the barcode element is for the barcode's start pattern, hence the class name bcs. Note I've used an i element because it's short and it's distinct from the b elements used for the number bars, but you could just use a span if you prefer. Similarly, there are also elements with class names bcm and bce for the middle and end patterns of the barcode respectively. Next are the elements for the first 6 digits, grouped in a span with class bcl. this wrapping element allows us to distinguish our styles for the left digits from the right digits (grouped in a span with class bcr), this is important because in UPC barcodes the same number is represented differently when it appears on the right hand side to when it is on the left - that's how your barcode scanner knows if the barcode is upside down! Because you can't style elements based on their text content this technique allows to avoid writing duplicate information in the HTML. So, let's look at an example of one of the digits, and where better to start than zero, and let's start on the left group of the barcode. 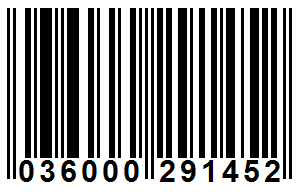 The zero digit, like all the others, has a width of 7 in units of the thinnest bar in the barcode. It turns out to be convenient to take this thinnest bar width as 0.1em, which gives us 0.7em per digit, which is just about right for spacing between the numbers, and also means are barcode will scale nicely with font size. All the other digits can be created similarly, and likewise for the digits in the right hand group of the barcode where the patterns are inverted. We also use a similar styling for the start, middle and end patterns of the barcode, which have widths 0.3em, 0.5em and 0.3em respectively.